For reasons I don't understand, I started getting interested in being able to make really good food a year or two ago. Perhaps it is all the traveling I've done that has given me the opportunity to try all kinds of different things. Or perhaps it is just the idea of gastronomical hacking that appeals to me. Dunno. It was about a year ago that I put together my Sous Vide rig, and My Lovely Wife and I had many fantastic meals from it since then. Going to restaurants doesn't hold that much appeal to me anymore, because after a meal I often feel that I could have cooked better at home. I don't consider myself a foodie, either. In my mind, a foodie is somebody who goes to some expensive restaurant to try wild and exotic things without lifting a finger themselves. That is not me. What appeals to me is using simple techniques to create something amazing. And that is why I like Sous Vide. It is almost foolproof. Anybody can do it. But I also like bread. 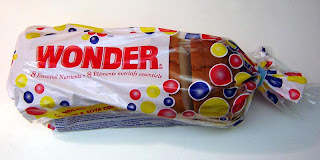 Real bread. I have been to places like France and Italy, where bread is a key part of the culture. The bread I had in Italy was easily my favorite. The crisp crust and the big holes on the inside (what I'd later learn is referred to as an "open crumb") hooked me and hooked me bad. Toast this stuff, brush on a little olive oil, rub a half a garlic clove over it, and then top it with fresh chopped tomatoes and a little kosher salt. Heaven on a plate. Bread where I live is typical mass-market North American crap, suited for little more than making egg salad sandwiches. This just wasn't acceptable to me any longer, with the memories of the bread I had in Italy lingering in my brain. Thinking that I had the protein thing down with Sous Vide, I decided to take on another popular macro-nutrient: carbohydrates. I began a quest to make good bread. As always, it starts with research. I had always been under the impression that great bread required a wood-fired oven and other things out of the reach of mere mortals. But Google quickly brought me to sites like Northwest Sourdough (Free Ebook! ), BreadTopia (Great Videos! 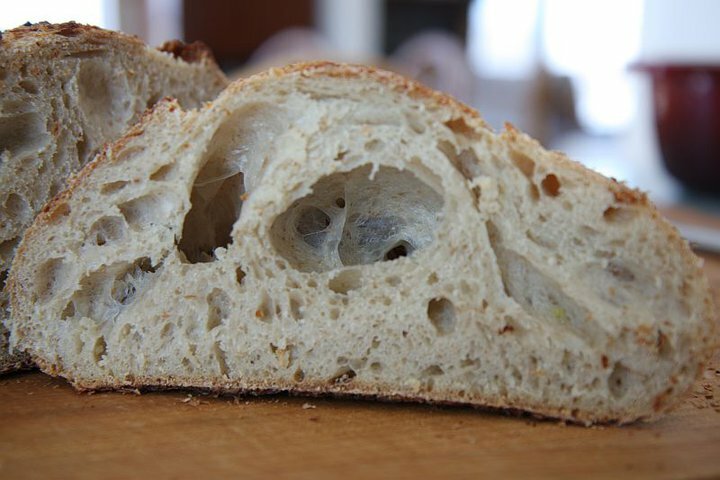 ), Sourdough Home (Clearest Explanations on the Net), and of course The Fresh Loaf (Amazing Forum!). I then bought myself a couple of books off of Amazon: Peter Reinhart's Bread Baker's Apprentice and Chad Robertson's Tartine Bread. I was taken by the bare-bones approach and beautiful pictures in Tartine Bread. This is where I would start - Tartine's Basic Country Bread. And, to make a long story short, this is where I would fail in eleven straight attempts to make a good artisan sourdough bread. Where Sous Vide was pure science and easy to get right, I was finding that there was much more of an art to making bread. I was having a terrible time trying to get the right combination of rise, texture, and flavor. I would tweak this and tweak that trying to get a bread that lived up to the pictures in the book. Then I hit what I simply refer to as Try #12, where things started to come together and I felt I was getting a decent grip on the many variables involved. So I thought I would jot some things down that might help out other aspiring bakers trying this recipe. I'm not going to go into all the nitty gritty details of how to make this bread. If you want a rough idea of what is involved in baking the bread itself, you could start here. 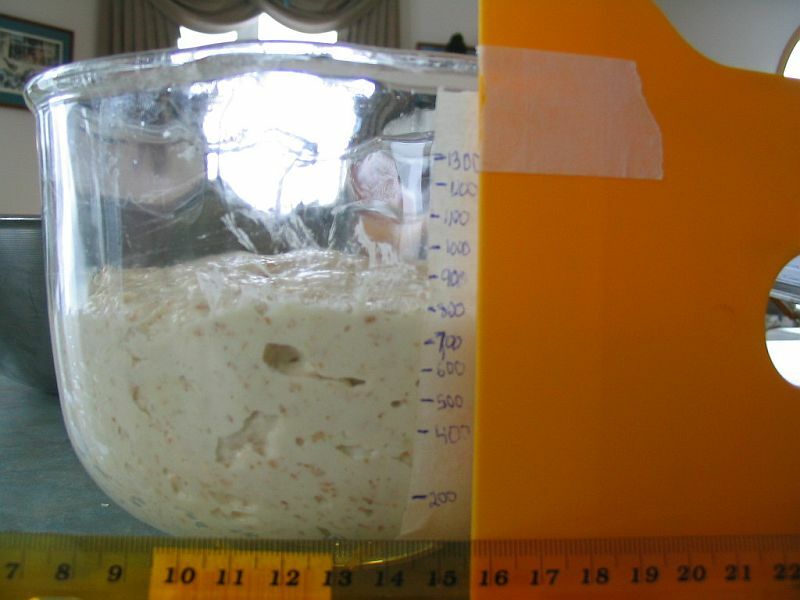 A great thread on the care and feeding of sourdough starter can be found here. My biggest problem with Tartine Bread right from the start was the, erm... starter. We left it on top of the fridge and fed it once per day in a ratio of 1 part old starter to 1 part new flour to one part water, by volume. That was a recipe for failure. Before refreshing it, the starter always smelled very sour. This was a sign that it was burning itself out. We weren't feeding enough to maintain a healthy culture that is key to a good rise. This explains the many "bricks" that I made. So we still leave the starter out on the top of the fridge, but we feed it twice a day in a 1:1:1 ratio by weight. 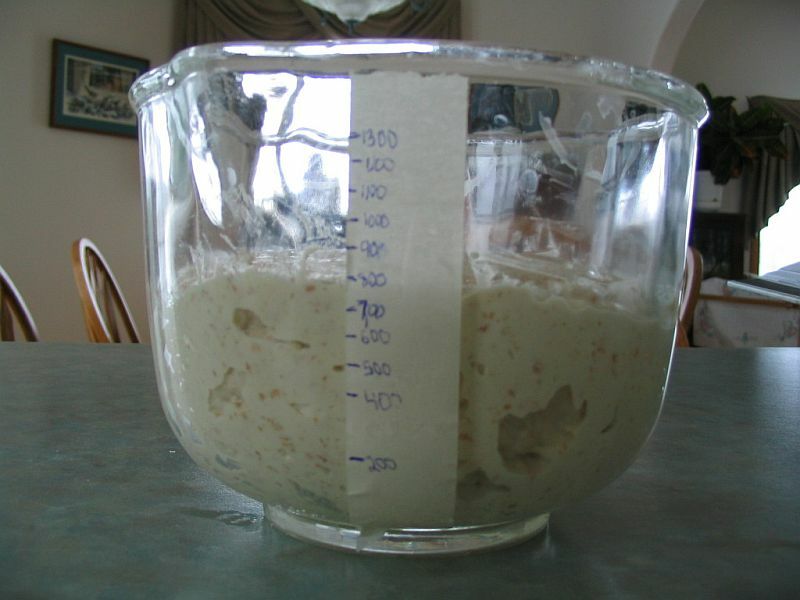 This ratio and frequency seems to be recommended by most successful bakers. We've been keeping a healthy starter with just 5 to 10 grams of each element to keep the amount of starter discard to a minimum. However, ever since we found this amazing pizza crust recipe, we have the opposite problem: how do we get more discard to keep up with our hunger for great pizza!?!? By the way, if you try that crust, you'll want this awesome sauce to go with it. The second problem that I had was with the rise during the bulk fermentation. I had fallen into the trap of following Robertson's guidelines for time (three to four hours) and temperature (80F). I went to great lengths to try to duplicate this environment exactly. I used my oven as a proofing chamber with my Sous Vide temperature controller turning a light bulb on and off to keep 80F exactly. A small DC powered fan circulated the air within to ensure an even temperature throughout. My temperature probe was twist-tied to the oven grill to give enough thermal mass to ensure accurate readings. I did all of this, and I never got the 20%-30% rise he talked about in the book in that time frame. I thought it was just some peculiarity with my approach and would give up on the bulk fermentation rise when it looked like things weren't going anywhere. It isn't the time or the temperature that is critical. It is the percentage rise. The big thing about Try #12 was that I figured I would wait for that 30% rise no matter what. It was just a bit of flour and water, after all. Try #12 just sat on the counter with some plastic wrap over the bowl to prevent the surface from drying out. I used a tip from the Recipes from Tartine Bread Facebook Group and did a S&F (Stretch and Fold) every half hour for the first two hours and then a more gentle S&F every hour after that. I would do this for as long as it would take. And it took five hours, but I finally got the 30% rise I wanted and, subsequently, the best bread I'd ever made. Judging the rise isn't straightforward if you don't do the bulk fermentation in a steep sized container with graduated marks on it. All I have is a glass mixing bowl. So all I did was get a piece of masking tape along the side of my bowl, put it on a scale, and added water 100 grams at a time. 100 grams = 100 mL, so I was basically marking off a measuring cup. After the autolyse, I put the dough in my mixing bowl and use the backside of a wet spoon to flatten the dough out. That gives me the initial volume. Multiply that volume by 1.3 or whatever rise you are after, and you know when to stop. Simple. Or not. I was having a bit of a problem with parallax errors. In other words, the level of the dough in the bowl changes if your eye isn't lined up properly with the surface of the dough. So what I do is measure the height of the final rise point on my bowl and measure that same height onto my dough blade (actually a plastic drywall knife). So as my dough starts to reach the point where it is getting to the end of its rise, I stick my dough blade at the back of the bowl and line up the tape with my final rise point on the front. That lines my eye up straight across. When the dough hits that line, I'm done my bulk fermentation. The next problem I stumbled with was the initial shaping. Robertson is terribly imprecise here, and there are no good pictures to give you a really good idea of what the right amount of tension during shaping is. It wasn't until I saw this video linked from TFL that made it all very clear. Watch this video. And then watch it again. It gets good around 1:20. Don't overwork the dough when you first mix it. Just work it enough to combine all the ingredients together well. Then stop. Cover everything all the time. I cover my leaven after mixing it with a bit of cling wrap. I cover my bowl during the bulk ferment on the counter and the final rise in the fridge using one of those shower-cap like bowl covers like this. This prevents crusts from forming on the dough surface at any point in the process. When adding the salt, don't just dump it on top of the dough and then dump in the extra bit of water. Mix the salt and water together first, dissolving as much of the salt as possible. Then dump that into the dough and mix. Speaking of salt, I find the bread a little salty for my tastes. Ever notice that you are kind of thirsty after a slice of bread? In the half batches I make, I cut back the salt to 8 grams instead of the 10 grams he calls up. 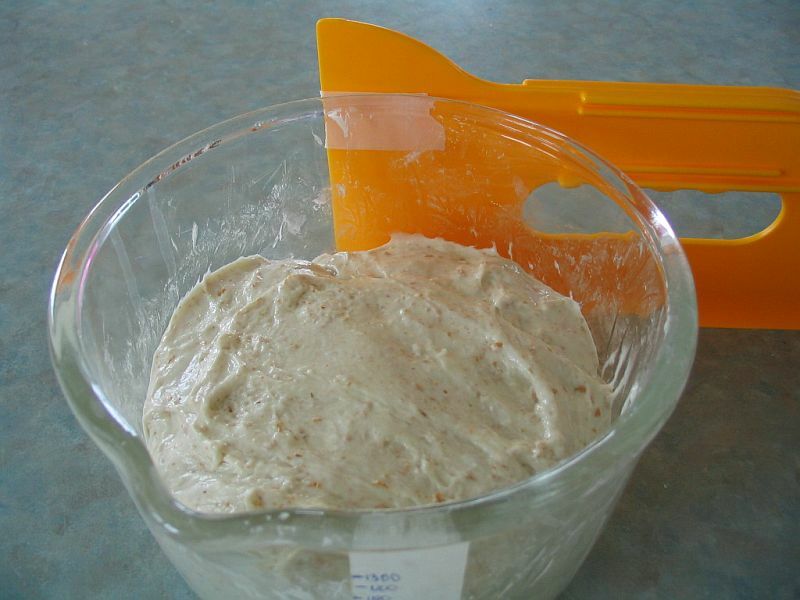 Try wheat bran instead of the 50-50 mix of wheat flour and rice flour that Robertson suggests in preventing the dough from sticking to the towel during the final rise. This is what Jim Lahey uses for his no-knead bread. Scoring the loaf with an X instead of a square just seems to work better for me, for some reason. I use a razor blade with a bit of spray oil to minimize sticking, and I make deep cuts. I don't go for pronounced ears by making shallow angled cuts because these thin ears just turn into pure carbon when the bread is toasted. And we toast this bread a lot. Throughout the book, Robertson writes about how you're supposed to be flexible as you go based on the signs the dough is giving you. And there's the rub. If you haven't made a good loaf of bread before, you don't have the instinct to know when the dough is ready to move on to the next stage or not. How do you know what is good and bad when you don't know what good and bad are? Hopefully some of the tips here will help people get on the road to good bread that much sooner. It is worth the effort. My success lately has been good, but I'm still experimenting. One thing I'm finding is that my fridge is too cool to get much action going during the final rise. In other words, it really doesn't rise in there at all. Setting the fridge warmer to get more rise is a sure recipe for spoiling the rest of the food in there and killing me. Getting a second fridge just for this seems a little silly. So what I'm trying this weekend is pushing the rise during the bulk ferment to 40% from 30% and seeing what happens. I might also try sticking with a 30% rise and just leaving it in the fridge for several days. That would likely help develop more sour flavor in the final product that I'd like to have. I have already pulled a few tricks like using the starter after it has peaked and started to fall back a bit, and by using a mere half teaspoon of starter in my half batch of leaven to add time to the process to try to bump the sourness a bit. But I'd still like more. Adding a higher percentage of whole wheat flour or maybe adding in some rye flour are other possibilities. Update: I mentioned above that I was pushing for a 40% rise this time. FAIL. The dough seems to hit equilibrium at around 30% with this hydration and doesn't go any higher. Now I know why Robertson recommends what he does. The moral of the story when working at this hydration is to wait it out until you get a rise from 20 - 30%, but don't get greedy and expect more. Thanks for this post noting the problems you had and the numerous links. I just got 'Tartine Bread' and hope to start the process soon. No-Knead (and Almost No-Knead) is good, but not as flavorful as I had hoped, though I probably should have hunted down various forum pages as you did. I have BBA as well but I keep going back to Tartine. I just made a loaf yesterday. My biggest problem so far is getting a loaf that has both an open crumb AND a thin crisp crust. I'm not there yet but I'm getting closer. I've been making no knead as well. The flavor doesn't compare but I am tempted by its many variations. This one, made with potato water, peppercorns, and parmesan is supposed to be pretty great. Excellent tips! I get frustrated at the same spots where he is vague. The 30% rise during bulk fermentation is a great help. Any tips on when the final rise is done? Hey! Great post, I know it's old...but I have been following tartine as well, and I'm wondering if I do a slow, cool (55-65f) bulk fermentation (8-12 hours), when should I be doing the fold/ turns? Thanks for such a thorough post!